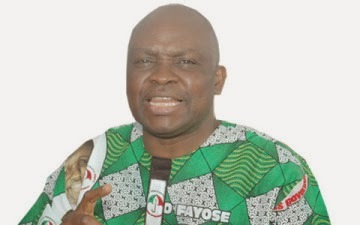 The 19 All Progressives Congress lawmakers in Ekiti State House of Assembly have vowed to go ahead with the impeachment proceedings against Governor Ayodele Fayose. The embattled Speaker, Dr. Adewale Omirin, has forwarded a notice of gross misconduct to the governor and his deputy, Dr. Olusola Eleka. Omirin has also requested the Chief Judge of Ekiti, Justice Ayodeji Daramola, to raise a seven-man panel to investigate the two over allegations of impunity, violence and stalking, among other constitutional breaches levelled against them. Omirin confirmed to The PUNCH on Wednesday that the impeachment plot was still in top gear and would be followed to the end. But the governor has warned the lawmakers against continuing with the plot, saying their action will boomerang as the people of the state will resist it. The labour unions comprising the Nigeria Labour Congress, Trade Union Congress and Joint Negotiating Council also planned to host a solidarity forum for the governor on Thursday (today) and Friday. Omirin, who spoke through his media aide, Mr. Wole Olujobi, said, “The impeachment process will proceed; we are expecting the Chief Judge to act soon on our letter asking him to set up a seven-member panel. There is no going back on the process. The matter is set for the next stage. “It is about the governor breaching the Constitution. We are guided by the Constitution. There are laid down rules and regulations that guide the conduct of public office holders. Once you commit an infraction, you have to face the consequence. Omirin countered claims that the governor had not been served the impeachment notice. “If he was not aware, why did he go to court to try to stop the impeachment plot? What is the basis if he was not served? As far as we are concerned, he has been served. Speaking through his Chief Press Secretary, Mr Idowu Adelusi, the governor said that the plot was not a war against him but war against the people of Ekiti State and God.